The effects of aging on the skin are familiar to all of us. Over time, the skin changes in four ways: it loses thickness, loses elasticity, loses adherence to the underlying tissue, and is affected by gravity. At the same time, the deep layers of fat, muscle and bone thin as well. One area where these changes are especially apparent is the upper arm. A Upper Arm Lift–or brachioplasty can lift and tighten loose skin in the upper arms, resulting in a firmer, more youthful appearance. If you have lost a lot of weight, or have sagging skin associated with aging , and you are unable to get rid of flabby upper arms, even through exercise, consider an upper arm lift . This procedure creates a smoother look to the upper arm, increases the tightness of the skin, reduces the appearance of fat, and creates a more youthful appearance. 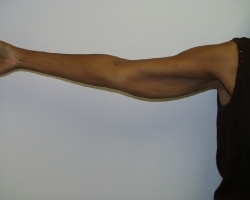 Upper arm lifts can also address flab or folds in the skin on the side of the chest near the armpit. The procedure is usually done under general anesthesia. In order to remove the unwanted skin, an incision is required that runs from near the elbow into the armpit. The incision is placed in the most inconspicuous location (inner arm toward the back), but some scarring will always be visible. After surgery, the upper arms are placed in an elastic sleeve to reduce swelling. Initial healing usually occurs in 10-14 days. Sutures are usually removed within the first 24 weeks. Swelling and bruising gradually disappear over 3-4 weeks. All swelling is gone in 3-6 months. The scars fade in 6-24 months depending on your skin. An additional procedure that may enhance the result is Liposuction of the upper arms.